This is a YA novel set in the UK, and honestly, I was initially drawn to the novel because of this setting. I never seem to come across that many YA fantasy novels that are set in the UK, as opposed to the US, and so I was really excited to pick this one up! 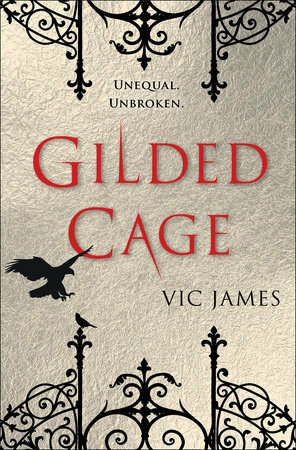 James has created a wonderful fantasy world in this novel. She spends a good amount of time describing the ins and outs of how the world works, and how the magic is used and distributed throughout the population. The reader also gets quite a few pieces of info about how the government and the ruling of the country is carried out, and how the world came to be that way. I am always really aware of these elements of a fantasy or dystopian novel, and James does an excellent job of building the world and sharing the world with the reader. The reader also gets quite a lot of information about how other countries are run in this fantasy world, and this was a pleasant surprise to me. 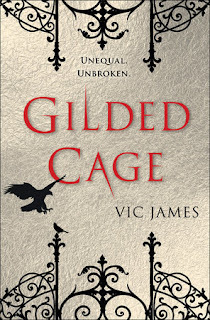 I often find that YA novels can forget to describe other countries, and the reader is left wondering how the rest of the world figures into the novel, but not in Gilded Cage. Despite there being a good amount of describing the world and the governing etc., this is still a fast paced and action-packed novel. From the first page this novel seems to fly along at 100 miles per hour until the very last page. One of the reasons the narrative seems to fly past is the narrative structure is split into a number of POVs. We read Luke’s POV in Millmoor slave camp, Abi’s in Kynessmore as a sort of secretary, and all of the Brothers. James utilises this split narrative to both keep the plot moving swiftly along, and to learn more about the world and the characters without ever feeling like the info is being dumped onto the reader. This is very clever by James, and I doubt the novel would work as well without this style of narrative. There are quite a few twists and turns in this novel, and there are definitely a few I didn’t see coming! The ending of this novel is another great twist, it ends on a cliff-hanger, and now I definitely need to pick up the next novel to find out what happens! !